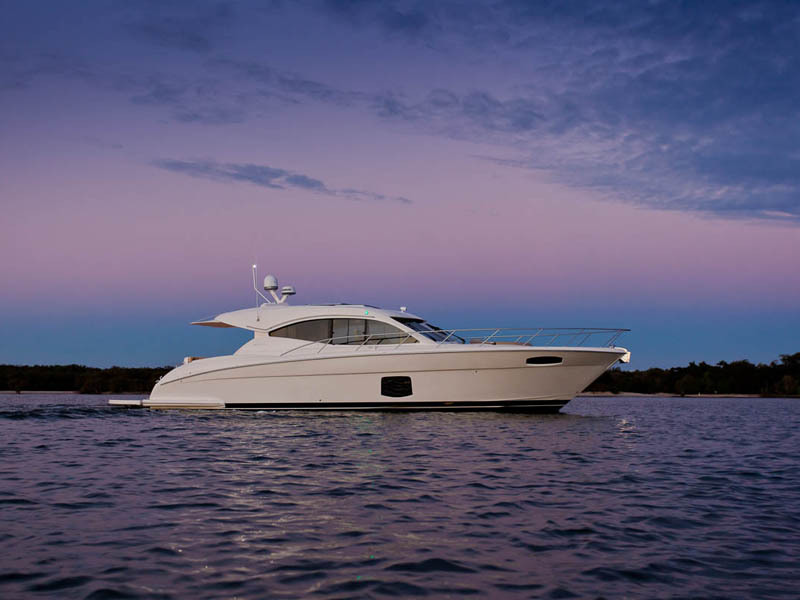 The latest member of the Australian built Maritimo‘s Sports Cabriolet family is a surprise from the moment you step aboard. A wide hydraulic lift swim platform that is large enough to host a party is just one eye-catching feature and it just gets better. 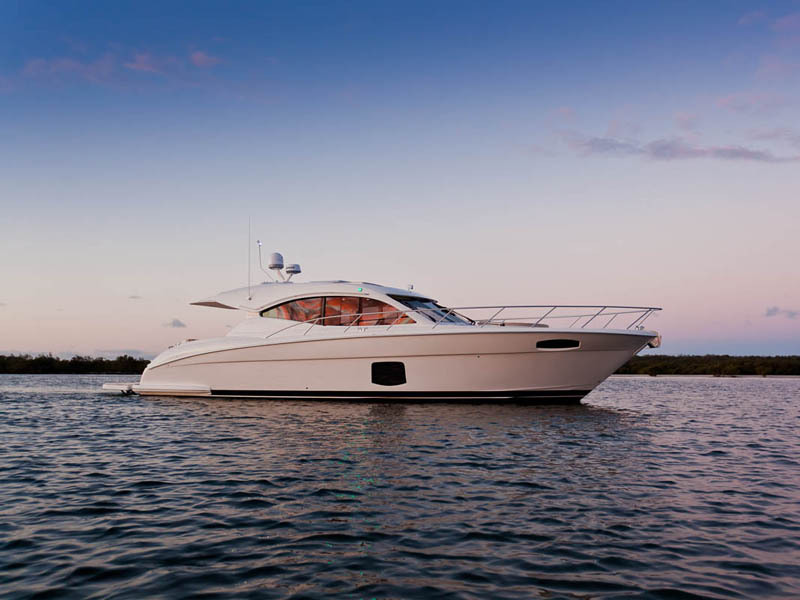 It is certainly a space many guests will want to hang out because lift up one of two hatches on the outside of the transom and you reveal a large fridge – just the place for the cold drinks. On the other side of the transom a similar hatch reveals an optional stainless electric barbecue and a sink with mixer tap – for cleaning up. Between the two is a doorway into the garage. 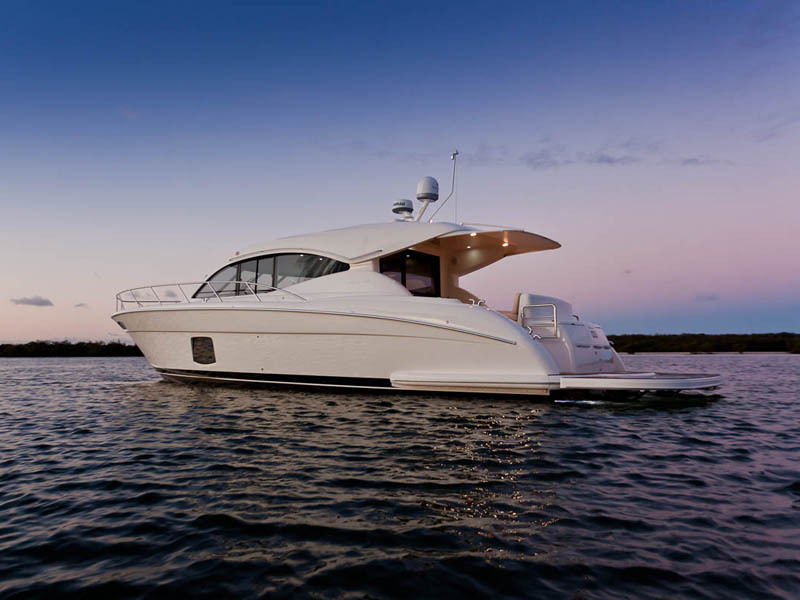 While the entire transom lifts on an electric actuator to open the garage for access to a tender, this smaller door is in the right place for stowing and retrieving swim gear such as snorkels or swim fins. For those who might be more practical, it can be stowage for fenders and lines. 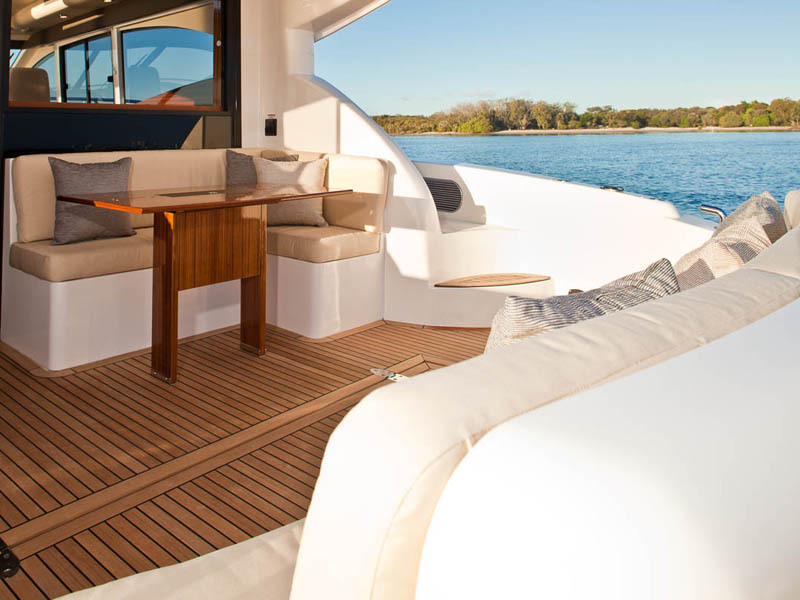 Two steps up is the main entertaining area of the boat, the aft deck. 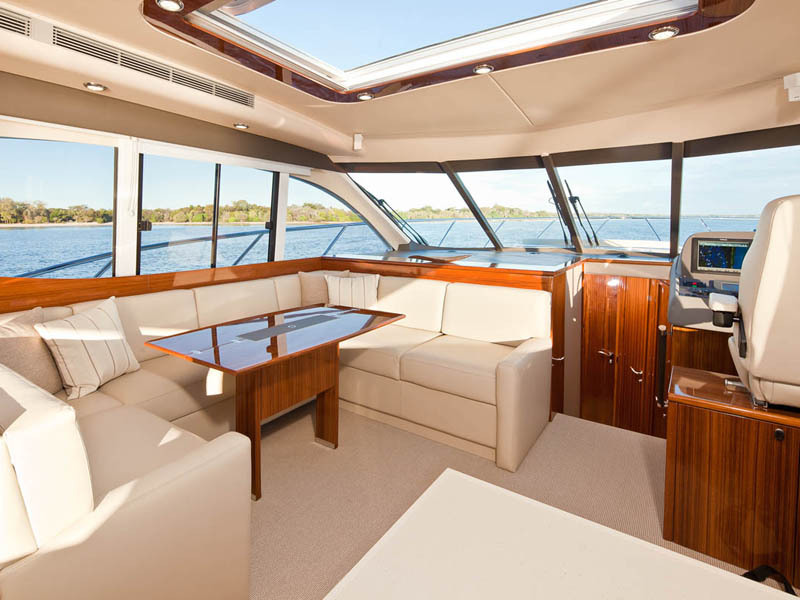 Here there is a long lounge across the transom and a second L-shape lounge inboard under an electric lift window that provides direct access to the galley. On one side of the cockpit is a bar fridge and on the other an ice maker. Much of this area is protected from the sun by a long hardtop overhang. Sun worshippers are not ignored however. 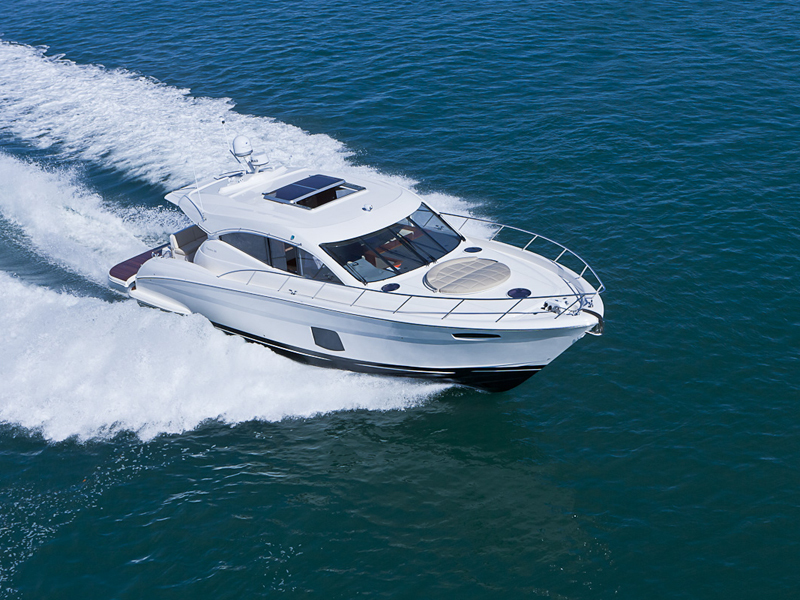 Walking forward on wide decks, the forward deck includes an optional fitted sunpad and stainless rail. Immediately forward of this is the anchor winch with foot controls and bow roller. 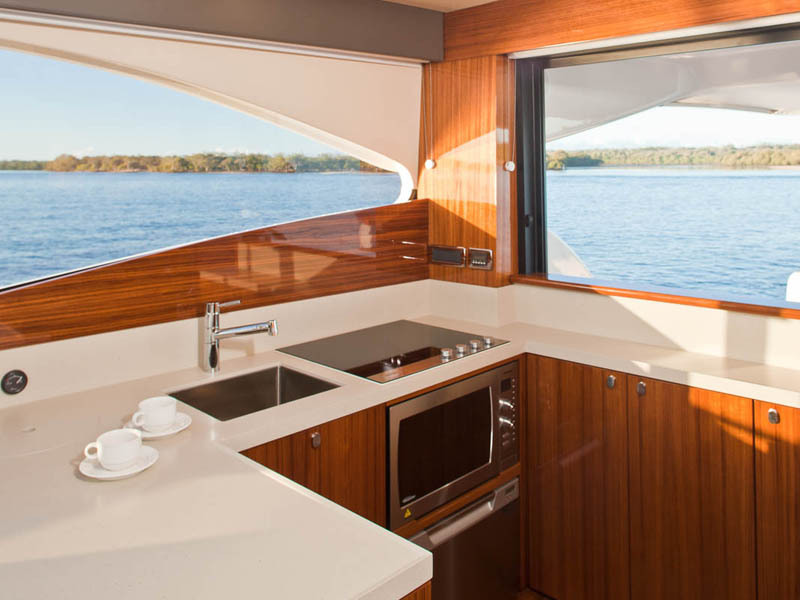 Step inside the air conditioned saloon from the aft deck and the galley spreads across the aft, with the main cooking and food prep area on the starboard side. There’s a four burner electric cooktop, convection microwave below and, below that, a pot drawer and drawer dishwasher. The stone-look benchtop has a stainless steel sink with mixer tap fitted and includes a fiddle right around to prevent splashed water running onto the Amtico timber floor. A gloss timber servery runs across the electric lift window so food can easily be handed out to guests on deck. Below the window is the comprehensive electric switch panel and, beside it, a cupboard for bottles and glass storage. Opposite, on the port side, is a two-door fridge and a pull-out pantry. One step up from the galley and the floor changes to carpet. On the port side is a massive U-shape lounge around a timber fold-out table. This is just the place for a relaxing meal, then sit back and pop up the LCD TV housed in a shining timber cabinet on the opposite side of the saloon. 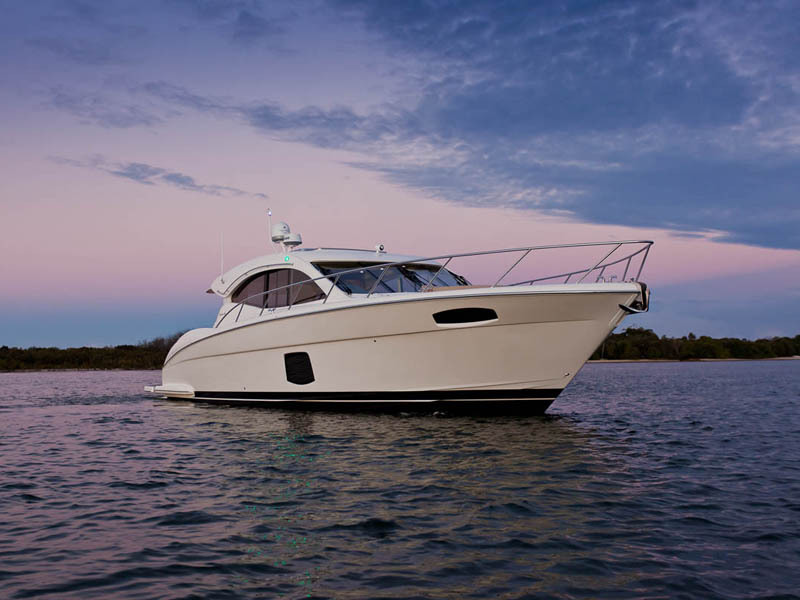 Immediately in front of the TV entertainment unit is the helm with its leather seat facing a dash with a timber sports wheel and space for two screens as well as the array of engine monitors as well as tab, thruster and anchor controls. Inboard of the helm is the companionway to the accommodation suite. After a long day out on the water, rest awaits on one of three cabins. The master stateroom is amidships on the port side. It is flooded with light from a large portlight in the hull. 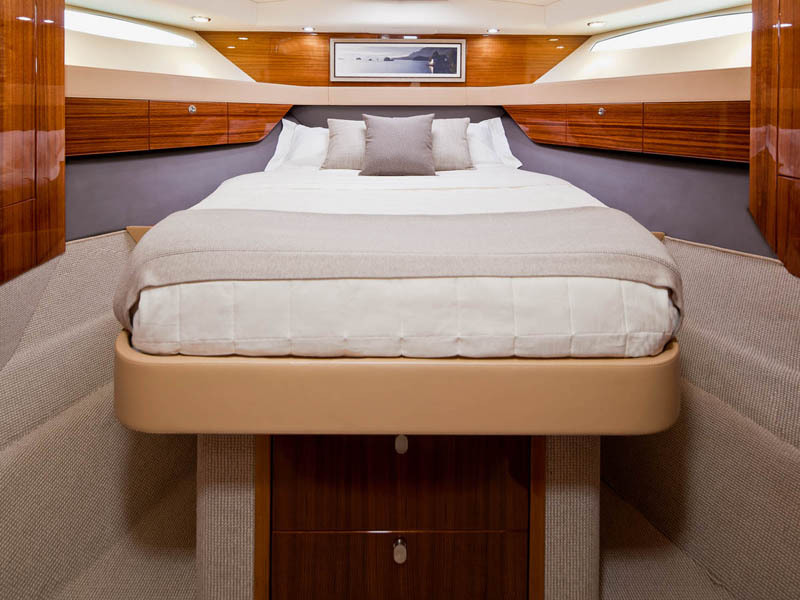 The stateroom includes a double bed that can lift to reveal a deep storage space. There is a deep hanging locker and drawers for general storage. The ensuite bathroom is forward of the stateroom and is equipped with electric flush toilet, vanity with stone-look benchtop, moulded sink with mixer tap and a separate shower stall. A deck hatch provides natural light and ventilation. 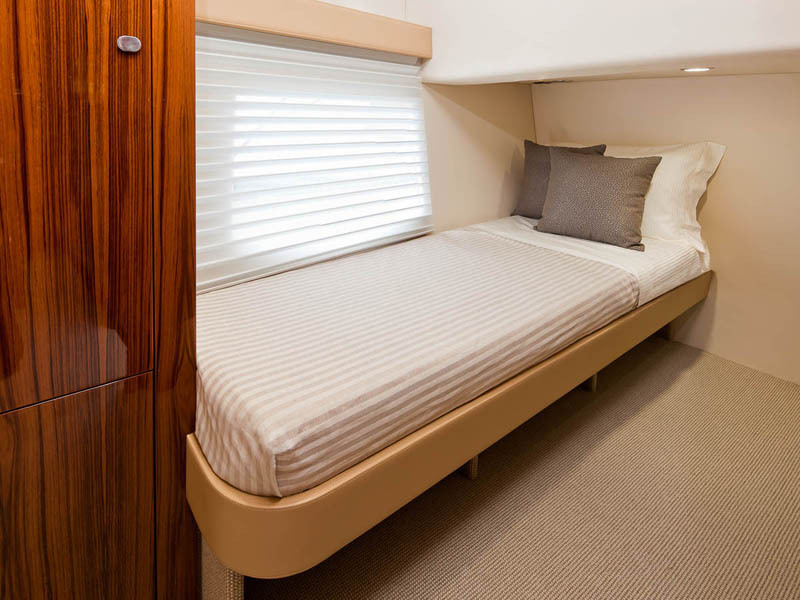 Opposite the master is a single berth cabin that also enjoys the benefit of a large portlight. This cabin also houses a clothes washer/dryer combo. 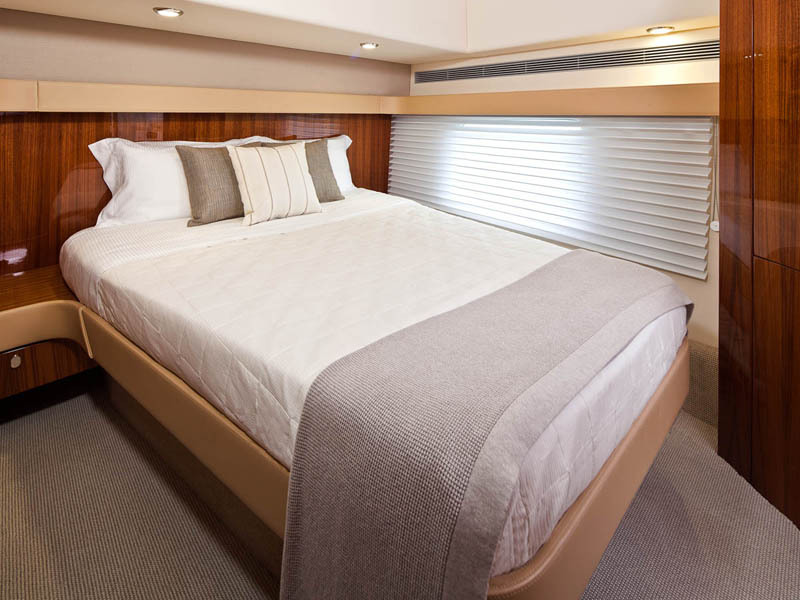 The guest stateroom forward features a double bed with storage under, fixed portholes on either side as well as a deck hatch for both light and air. The second bathroom on the starboard side is equipped with two access doors so it can serve as an ensuite for a guest couple of as a day head. This bathroom is similarly equipped to the main ensuite including deck hatch. Access to the cavernous engine room is through a hatch in the galley floor. With near full head height, this area makes maximum use of available space. 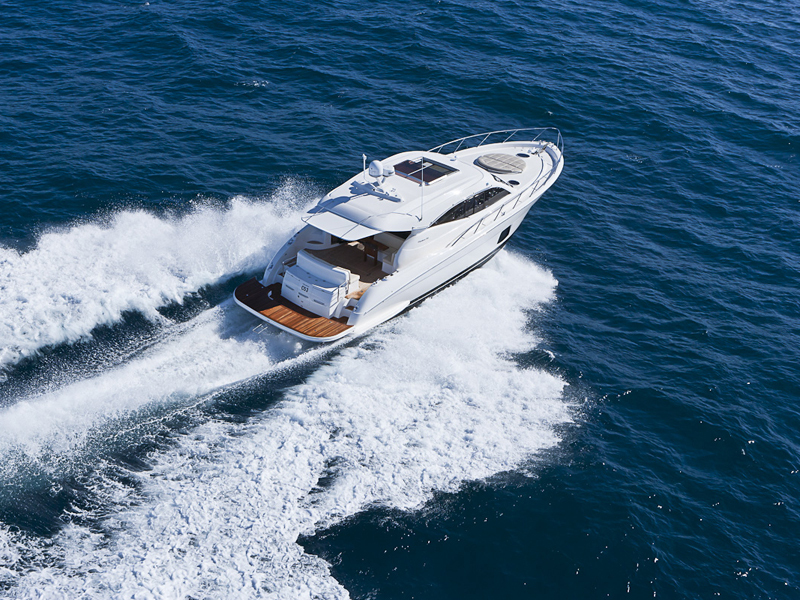 Standard power for the C53 Sports Cabriolet comes from a pair of proven Volvo Penta D11 turbo diesel engines, each delivering 670 mhp. 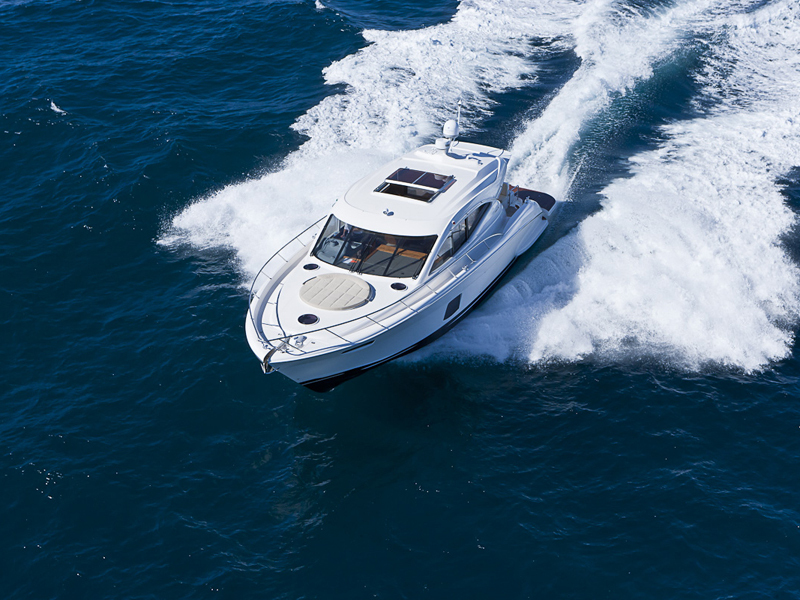 The C53 is sure to put a twist on any customer looking at European models as Maritimo have provided yet another interesting alternative.